SARONIC GULF ISLANDS, ARGOLIC GULF AND NORTHERN CYCLADES ISLANDS. To help clients get a better idea of what to expect on a 7 day cruise we have 3 different styled options.Trips will start and finish from Athens, specifically Marina Alimos. Time of departure will be close to noon. Guests will be picked up from their Hotel around 1030am and brought to the yachts in Marina Alimos. After yacht allocation and berth allocation, there will be a safety and yacht orientation talk by the captain. Once everyone is comfortable and briefed the yacht will depart Alimos Marina. The overall structure of this charter will be to involve the students in as much as possible in the operation of the yacht. Learning how to sail, how to cater to their group. They will be responsible for all chores domestic and deck. Without being a sailing school they still will be involved in maintaining a smart professional yacht. Please take a look, these are merely suggestions, should you have something in particular you would like to see please let us know. This is a good way to get a flavour for the Greek islands. Easy sailing, short distances on the water with sheltered sailing areas. Always in sight of land. Athens to Ancient town of Epidavros stops along the way for swimming etc. The town of Epidavros is the sight of one of the best examples of Ancient greek theater construction. Just outside the town is the main theatre that can seat 15,000. It was built around 2200 BC. A trip to see this ancient marvel is easily arranged. Other activities available in this village include, scuba, trekking, and Para gliding. Sailing time to Epidavros about 4hours, 30 miles. Epidavros village to the island of Poros. 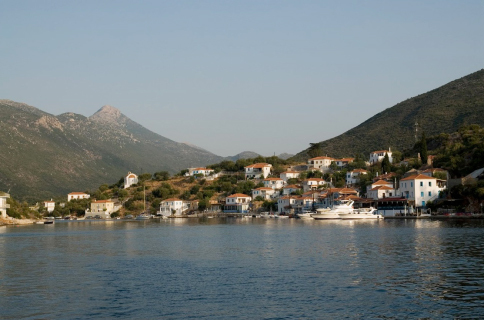 On arrival in the huge bay of Poros you can anchor in Oyster cove, swim and dive for fresh sea oysters. Poros is a very cosmopolitan island with good shopping, great beaches and lots of coves to explore and a good night life with bars and disco’s. Sailing time around 3 hours, 20 miles. Poros Island to the Town of Erimioni stopping in Teslavina bay for Lunch. To day the yacht will take you to a secluded bay for Lunch and Snorkelling and swimming. Then a great sail to the Old town of Erimioni. The town is quiet greek fishing village, where you can still experience old Greece. There are some exceptional walks and treks the students will enjoy. The best being around the peninsula though the ancient forest and back into the old town before returning to the Yacht, about 5 – 6km walk. Sailing time around 2.5 hours, 19 miles. 1. Sailing trip to Spetsai Island and stay overnight if dockage available, 3hr sailing trip lots to see on island, wide variety of suitable night life. Sailing time 3 hours, 18 miles. 2. Sail trip to Southern Peloponnese port of Plaka, this would be a more “sailing” trip with about 4 – 6 hours and it could involve medium winds making the trip seem exciting, and quick. The port is very small about 12 houses but located below a huge mountain. Spectacular scenery. Sailing time 6 hours, 30 miles. 3. Sail trip to Koladia, with stops on the way for swimming and snorkeling. Koladia is a working fishing port where the offshore fisherman operate. It’s a rare sight to see wooden Greek style fishing craft of 23m. The village also has wooden ship building yard, where the wooden ships are built. Witness old style craftsmanship here. Sailing time 4 hours, 20 miles. Returning back towards Athens, today you will make a lunch time stop over at the island of Hydra. Here you will be able to visit a unique community where there are no vehicles on the island. Transportation is by means of donkey or mule. This is a mountain village with a tiny harbor and tiny narrow streets. Spend a few hours wondering around the maze of alley ways and experiencing a different Greece. The Yachts will depart at around 4pm and you will sail back to Poros Island and anchor for the night in a secluded bay, where the yachts will have a crew night at anchor with on board BBQ and anything else that can be found. Perhaps the captains will show you where to find fresh oysters or clams? The last chance for a good days sail, so today you will sail out towards the island of Angistri, briefly stopping for lunch, after sailing into the Port of Aegina Harbor. On the way to we will arrange for the group to have there picture taken on the yacht while sailing. Aegina is a unique island with many facets, it is a huge producer of Pistashios, Olives and Olive oil. The temple of Anafi is on the island, this is the only example of a complete temple from ancient times. Also one should visit the Monastery of Aegina, the nuns hand make some of best lace in the world. Sailing from Aegina Island back to Athens. Today is your last chance to collect the last of your Greek island souvenirs before the yacht heads back to Athens. Your arrival back in Athens at the Marina will be around 1pm weather depending. Champagne sailing conditions in easy sheltered areas with some good distance sailing. 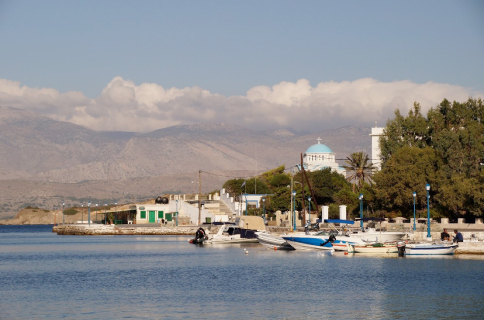 Visit the Old National capital town of Navplion, as well as the island of the Saronic Gulf. This itinerary would be suitable for a family that has fair/good sailing experience. Keeping the distances from short to longer allows a good chance to pratice seamanship skills. It also gives plenty of opportunities to see the islands and villages along the way. If you have sailing experience then the sailing can be made more challenging, by having you actually run the yacht if you wish. The captain will be in the back ground helping when needed. Athens to Ancient town of Epidavros stops along the way for swimming etc. The town of Epidavros is the sight of one of the best examples of Ancient Greek theatre construction. Just outside the town is the main theatre that can seat 15,000. It was built around 2200 BC. A trip to see this ancient marvel is easily arranged. Sailing time to Epidavros about 5 hours, 30 miles. Poros Island to the Town of Erimioni stopping in Teslavina bay for Lunch. To day the yacht will take you to a secluded bay for Lunch and Snorkelling and swimming. Then a great sail to the Old town of Erimioni. The town is quiet greek fishing village, where you can still experience old Greece. Sailing time around 2.5hours, 19 miles. Ermioni to the village of Plaka. Plaka is a small village on the southern Peloponnese coast. The village is located under huge mountains that give one the feel of being in Scotland. A good sail of over 30 miles. Sailing time around 4.5 hours, 30 miles. From our alongside berth in Plaka we will sail up to the town of Navplion. Navplion has been an important port for the area historically for many years. Here you can shop and sight see the ancient castle. Sailing time around 4 hours, 30 miles. This morning will be an early start as we have to sail all the way back to Poros Island. If the weather allows a lunch time stop in Hydra is possible before sailing back into Poros harbour. Sailing time around 6.5 hours, 56 miles. Aegina Island return to Athens. Depending on what time your flight leaves will determine when we leave Poros for Athens. Sailing time around 4.5 hours including docking, 30 miles. Time to Airport from Marina berth, 1hr. Option 3 – Hard, Experienced sailors only. Northern Cyclades with 75nm Passage. 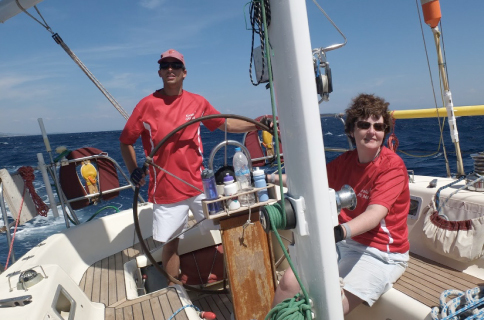 A challenging weeks sailing around the Northern Cyclades Islands and an open water sailing crossing. Experienced sailors need apply. This is meant as a guide to the best way to spend 7 days cruising around the Western and Central Cyclades. This is for experienced sailor who like long ocean style trips and enjoy getting into port at night. 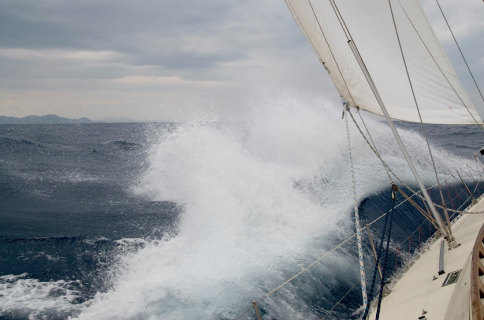 One should expect to sail around 230 – 250 miles in the 7 days, bearing in mind the rest days on some of the islands. Leave Athens and sail to Kea Island. Kea Island is a mountainous island. The yacht will berth in the town of Voukrai on the northern tip. The main town is up in the hills. One of the attractions to this island is probably the best fish restaurant in Greece. Katerina’s Fish Taverna has been in business for over 60 years. The house speciality is Lobster with fresh home made Pasta. Sailing time 6 – 7 hours, 40 miles. Leaving Kea around mid morning a short sail to Kithonos Island and the port of Loutra. Here the small village has volcanic pools of hot springs a visit to the ancient baths in Loutra is most refreshing, followed by a swim and dive off the rocks around the village. Sailing time 3 hours, 18 miles. As a general rule the yacht will leave each port around mid morning todays sail to Siros Island and the town of Finakas is likely to be a quick blast reach. Siros is an all catholic island in the middle of a Greek orthodox kingdom. Visit the main town of Ermopouli and have a feel of the conflict between these religions. Sailing time 3 – 4 hours, 30 miles. To day we have a choice, you can sail south to Serifos island and enjoy the delights of this mountainous island or Sail to Southern tip of Kithonos Island to the secluded bay of St.Nicholas anchor out on anchor and enjoy a Yacht side barbque. Sailing time 4 – 5 hours, 25 – 35 miles. Sail from Kithonos/Serifos to Poros Island. This will be an ocean type passage where you will lose site of land, there is no stopping here. The departure from Serifos will be early so that we can arrive in good time in the early evening. The passage is an RYA and ASA ocean qualifying trip. Sailing time 8 hours, 60 miles. Here in Poros you can either rest and explore the island or we can continue to Epidavros and see the ancient theater. The sail to Epidavros will be about 3 hours, 20 miles. Return to Athens from Poros or Epidavros. It will take 4 hours to sail from either place, 35 miles.